We are a private club track that will be used by family, friends, & members and will be open to the public for races to help support the club’s mission. The club’s mission offers a place where parents/families can bring their mentally challenged, medically challenged, youths and adults to learn a new sport activity. We will have them come to the track with their family to play in a private setting by appointment only. We are not wheelchair accessible. The goal is to be able to eventually have them be able to race with each other. Then onto a combination field when they are ready to race with new people. We are working with the NHS Carlisle Autism School, the Autism Society - Greater Harrisburg Area Chapter, UCP Adult Group Homes and the Ronald McDonald House. 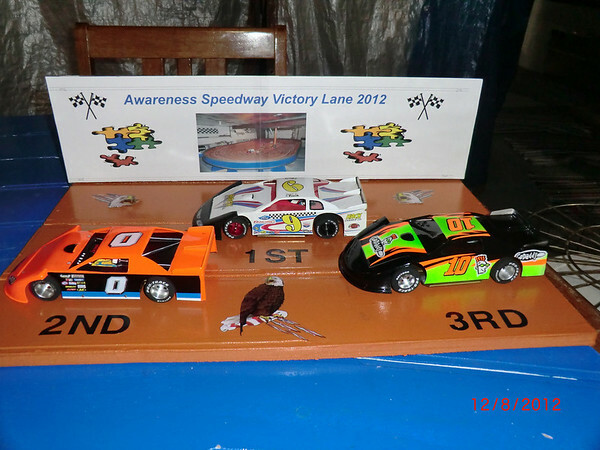 We are going to have 5 or 6 races for dirt style slot cars in 2012 - 2013 for our racing members to support the club’s missions. If interested in participating or becoming a member or a Track Racing sponsor please visit our web site or Facebook page for more great info and contact information. Last edited by zipzap on Mon Jan 28, 2013 10:05 pm, edited 1 time in total. We are working with the NHS Carlisle Autism School, the Autism Society - Greater Harrisburg Area Chapter, Adult Group Homes and in the near future the Ronald McDonald House. If interested in participating or becoming a member or a Track, Racing sponsor please visit our web site or Facebook page for more great info and contact information. 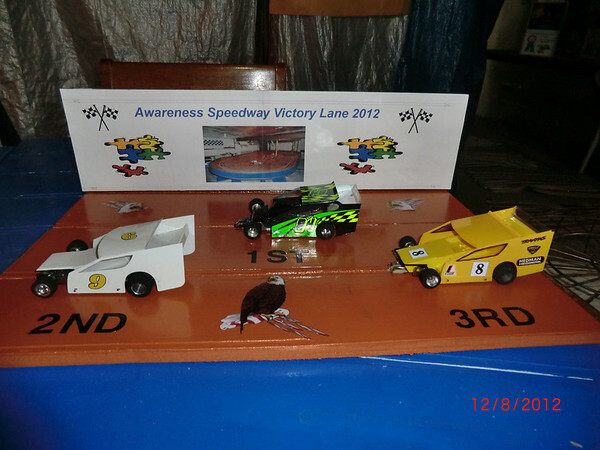 There was a portable track down at VA Motor Speedway for the Commonwealth 100 that is "the only Lucas Oil Series Sanctioned Slot car track". Apparently, they did some sort of charity event and got the Lucas Oil Series to "sanction" it. I'll see if I can find the fellow's contact info, because the one thing that you could probably use is that they appeared to have a template for printing dirt Late Model bodies on sheets of card stock, which they then cut out, fold up, and fasten appropriately to use for their slot car bodies. It's cheap, and given how the real ones are made from sheet metal, it really does convey the look of the real thing quite nicely, and by being able to print them on a color printer, you can do all sort of paintjobs or replicas of real cars just by manipulating the template in a suitable software program. If I don't find the info, I would guess that a web search for Lucas Oil sanctioned slot car track would probably find them. They seemed to be really nice folks, and I'd bet that they'd be willing to share ideas and lessons learned with you. Yes there web site is http://www.outbackmotorspeedway.com/. They have super late model drivers race at there track. We don't run there type of late model here at our track we run a lexan late model body. Check out our web site to be able to check out our cars that we race. 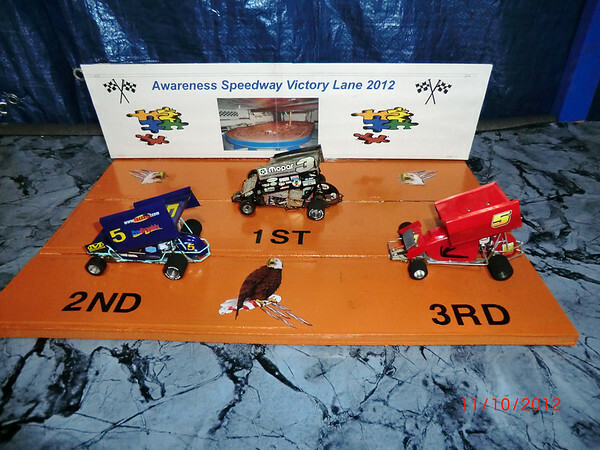 We run 1/32 winged sprint cars and other dirt classes. 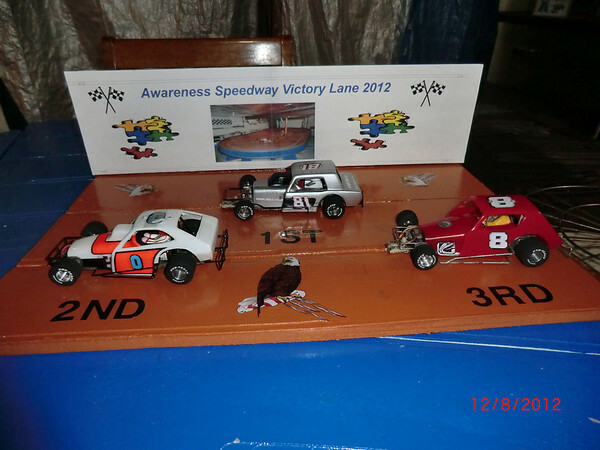 We currently have 6 active familys using the track. 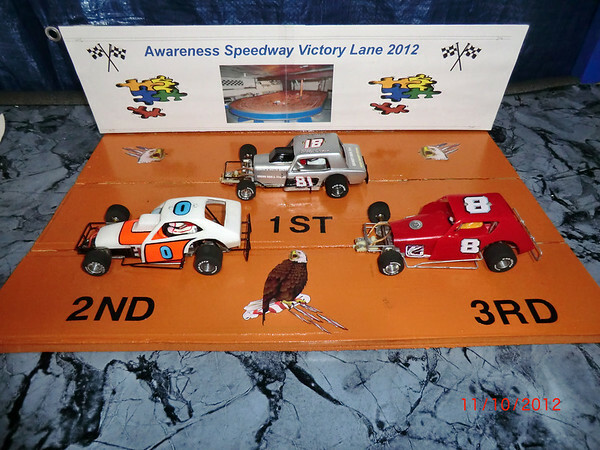 We are always looking for sponsors to support our racers who then support the tracks mission. We are getting ready for our fall racing series. For more info and pictures of our sprint cars visit our web site. Here is a video of our special friends program and track. Showing how we offer our special friends program that can be tailored to each individual. Would like to say a great big thank you to all the racers that showed up and supported our racing program and our clubs missions. 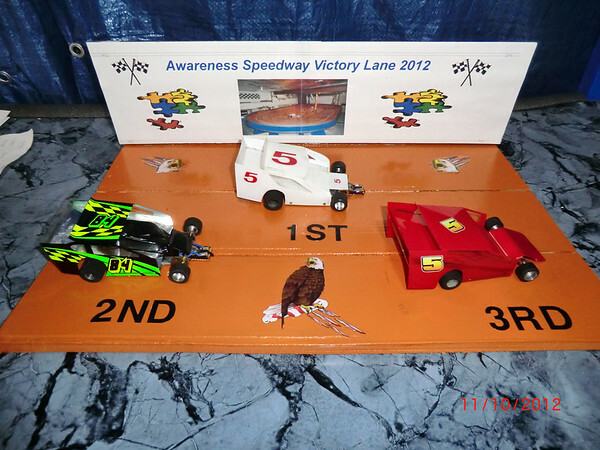 The racing was fast and close in all classes. There was a lot of laughter and fun had by all. Last edited by zipzap on Sun Feb 08, 2015 2:55 pm, edited 1 time in total. Almost race day again. We have some of our special friends coming to watch our racers race. I know one of our special friends attends the grove with his family. A great big thank you to our Award Sponsor. 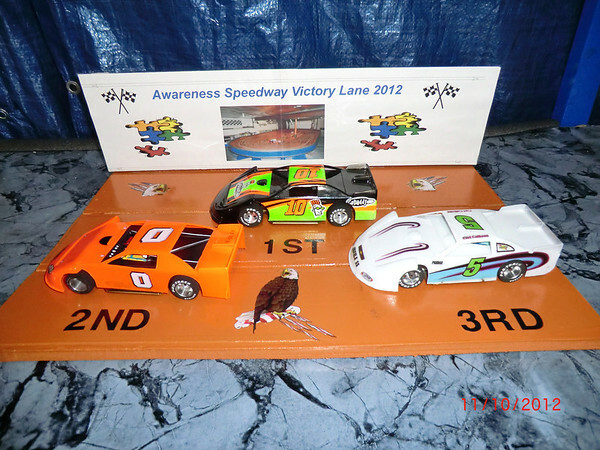 Wishing everyone a Very Merry Christmas from Awareness Speedway Slot Car Club. Looking forward to an awesome 2013. Our new mobile web site is up and running. 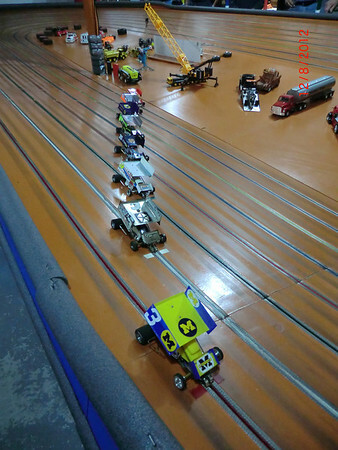 I'm pretty sure your talking about Tim Hottles track here in Winchester VA. Www.outbackmotorspeedway.com Slot cars are pretty big down here. Last edited by zipzap on Tue Mar 03, 2015 9:38 am, edited 1 time in total. Most people know someone in their neighborhood, work, school or church who has a child who has special needs. Due to increasing interest and popular demand, Awareness Speedway is seeking to find an attorney or new grad law clerk who specializes in setting up charities or NPOs in Pa. Please let us know who you know who can help us get started to become a charity. Thank you sooooooo much!!! WE are having a open house from 9am to 3pm. We are having a class on natural healing at 1:30pm. 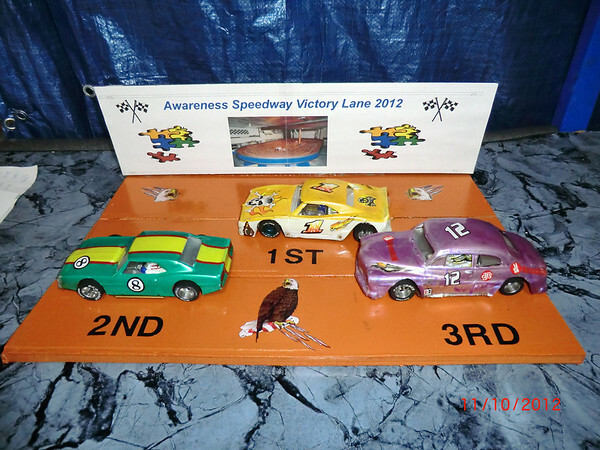 The track is open to the public to run on and put a smile on your face also to find out what our program for the public and our special friends is about We are also launching our fundraising campaign to be come a non profit and then become a charity . We need to raise $6000.00 to accomplish this. . Please visit our web site and use contact info to receive address.